Earlier today, I reviewed a delightful book for young adults called QUEEN OF SECRETS. I really liked this current take on the classic Queen Esther story from the bible, and I think teenage girls are going to love it too. I am so glad that I had the opportunity to ask the author of this novel, Jenny Meyerhoff, a few questions about her novel and her writing. So many of her answers are just fantastic (and straight from the heart), and I hope you enjoy them as much as I did! Booking Mama: Your first book THIRD GRADE BABY was for younger children. What made you decide to write a Young Adult Book? Jenny Meyerhoff: I wish it had been a thought out decision! The first book idea I got was for a chapter book, the second book idea I got was for a young adult novel. I just wrote the ideas as they came to me. At that point in my career I hadn’t published or even really submitted all that much and I didn’t plan to publish or submit those books at first. I really intended to write them for practice, more than anything else. In retrospect, to be able to build an audience, it probably would have been better to stick with one age group for a while. I have a lot of young readers asking me about my next book and I can’t point them to QUEEN OF SECRETS! I do have another book for younger readers coming up next, though, so hopefully I’ll have a pattern of alternating books for each age level. Booking Mama: What was your inspiration for writing QUEEN OF SECRETS? 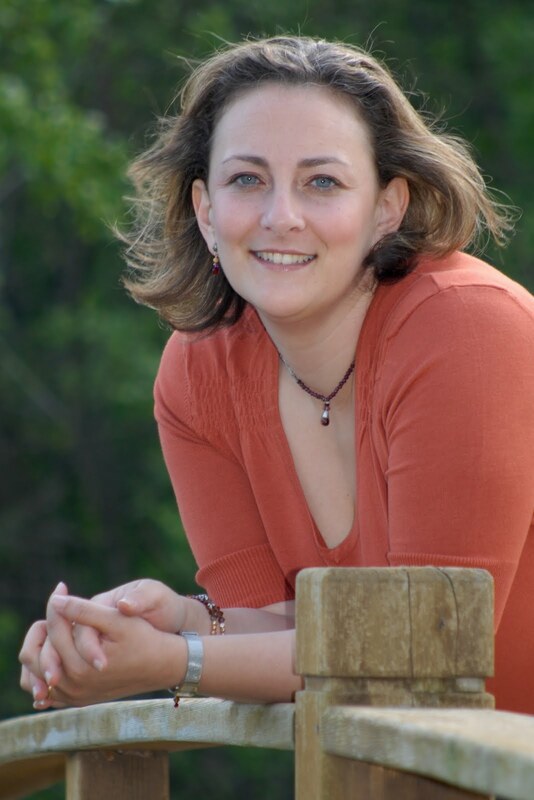 Jenny Meyerhoff: QUEEN OF SECRETS is a modern retelling of the biblical story The Book of Esther. I’ve always been fascinated by the story because it’s got such a strong heroine, and one day I had the thought that Esther must have been a teenager. Then I wondered what her story would be like for a teenager in today’s world. The rest just came from there. Booking Mama: What does your writing space look like? Jenny Meyerhoff: I am so fortunate to have a room of my own (an office!) in my house. 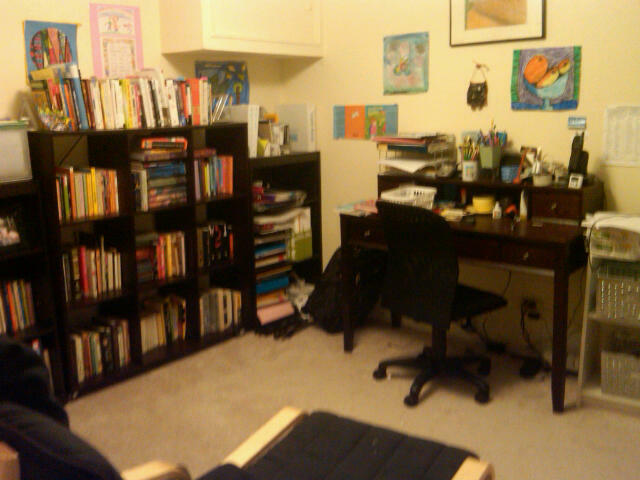 It’s got a desk, bookshelves, a craft table and a comfy chair with an ottoman. It’s a really cozy space that I love. 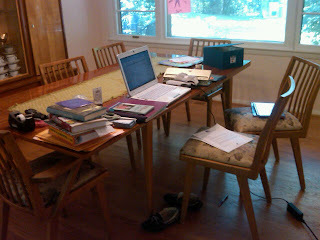 Having said all that, I cannot explain why most of the time I write at the dining room table. I’m constantly lugging books and papers from my office to the table and back again. And I have to go to my office to print, so why don’t I just stay in there and write. It’s a mystery. But it’s working for me, so I don’t question it too much. Booking Mama: You are a wife, a mother of three children, a huge reader, and a writer. How do you find time to "do it all?" Jenny Meyerhoff: Well, I don’t do it “all.” That’s the tricky thing. You can be a mother and a reader and a writer, but you might not have time to be much else beyond that. My youngest is going to enter kindergarten this fall. For the past several years my writing time has either been during his naps (when he was little) or during his pre-school hours (as he got a bit older.) This has given me a solid two hours of writing five days a week and I find that if you commit to those hours day after day, week after week, year after year, that really is plenty of time to get a book written. When my kids are home, I try to just be a mom: play board games, chauffeur them around to activities, etc. And I do not have a TV in my bedroom, so I read every night before going to sleep. So that’s how I manage those three tasks. But here is a list of things that I do not do (that I used to do or hope to do): clean the house well or often, take art lessons, take music lessons, lunch with friends, teach kindergarten, horseback ride, do yoga daily. As my kids get older I hope to add one or more of those back onto the list of things I do (well, maybe not clean the house) but there is no way to do everything! At least that’s what I tell myself. Booking Mama: What do you hope your readers take away from this novel? Jenny Meyerhoff: I’m always amazed by people in my life who are so certain of themselves that they always know what to say, how to act, what’s the right thing to do. I am not like that at all. I can always see multiple sides to every issue and question and so I often find it hard to have strong opinions or decide how to take action. I really wanted to write about a character like that. For a long time I saw this as a personal failing, now I see it’s just a personal trait. I hope that if there are others out there who are like that there will be some comfort in seeing a character that mirrors those characteristics. So I hope they take that…and that feeling of falling in love. Booking Mama: And now the question I ask every writer when I get the chance. Who are some of your favorite authors? Jenny Meyerhoff: Oh! Such a tough question. There are so many. But I guess I’ll top the list with Jane Austen. I reread all of her books every few years. Megan Whalen Turner is another whose books get read repeatedly. Other authors I love are Kristen Cashore, Sara Zarr, Emily Giffen, Jonathan Stroud, Philip Pullman, J.K. Rowling, Mette Ivie Harrison, Sarah Dessen, Deb Caletti, Claudia Mills, Lisa Yee… That list is so incomplete, but it’s all I could think of at the moment. Thanks so much to Ms. Meyerhoff for answering all of my questions! Thanks for sharing the interveiw questions. I suspect that Esther was a teenager and I think that imagining her in today's world was clever. Enjoyed this post. Great interview! I love the light in her dining room - maybe that's why she writes there. I think Jenny and I have a lot in common - I'm amazed by people who are so certain of everything too. I must confess that I would have passed on reading the novel - based on the cover art (not interested in returning to my adolescent years) --- but this interview has made me truly realize that I cannot judge a book by its cover! I look forward to reading it sometime soon. Terrific interview! I really, really enjoyed reading it. What a fun interview! I love the pictures. I can't wait to check out Jenny's books! I love the idea that Jenny can't write in her official office. I guess the light or environment is just perfect in the dining room. really enjoyed reading this interview--such a neat lady! It was so nice to be a part of such a fantastic blog. Thanks to Booking Mama for having me and I am glad you all enjoyed the interview!